Daniel Lafferty (white shirt) in action for Posh. 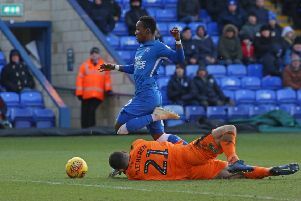 The Peterborough United players are refreshed, focused and ready to give everything in the final seven games of the League One season. A rare weekend off has left Posh five points adrift of the play-off places, but the break could still work in the club’s favour according to on-loan Sheffield United left-back Daniel Lafferty who was speaking ahead of Saturday’s League One home game with Gillingham (April 6). Daniel Lafferty is dejected after Posh were beaten at home by Coventry last month. “There have been a few ups and downs since the new manager came in,” Lafferty, who was signed until the end of the season by previous Posh manager Steve Evans, said. “So it was good to get a break and be fresh both physically and mentally for the run-in. “We worked hard at the back end of last week and we have worked hard this week. “We know what we have to do and we are ready to give everything in the last seven games or so. “The new manager has been great. He’s friendly with everyone which isn’t always a good thing, but in this case it is. “He’s excellent on the training pitch and excellent around the training ground. There is a good feel about the place. “We are working more on shape and being good in possession. The manager encourages full-backs to get forward and he’s comfortable with centre-backs carrying the ball forward as well. He’s very positive and the lads are enjoying that. We have some tricky games left, but they are the sort of games successful teams have to win. Lafferty is out of contract at Bramall Lane in the summer, but he’s given little thought to his future.